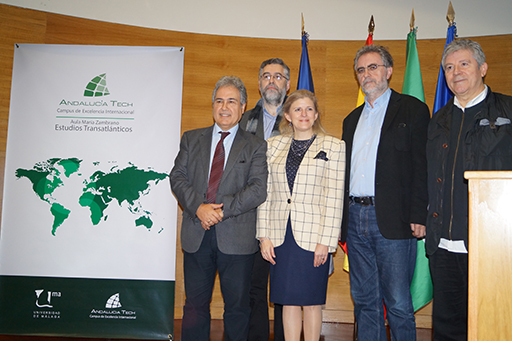 The Aula María Zambrano of Transatlantic Studies UMA – ATECH has dedicated the 4th Transatlantic Tribune to Juan Antonio Ortega y Medina, native of Málaga and exiled in Mexico, where he got the National Prize of History, Social Sciences and Philosophy. 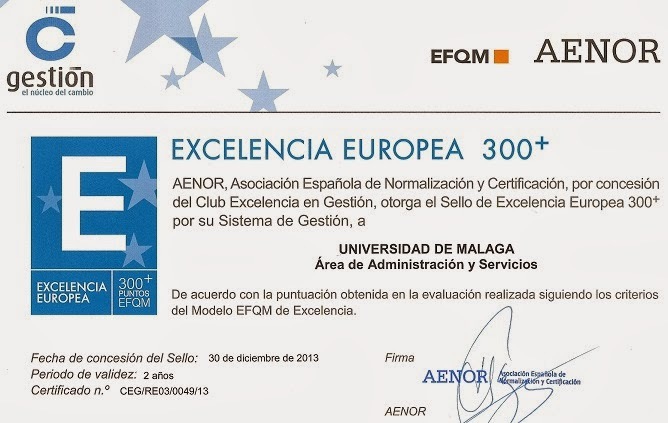 The event took place on December 19, 2016 in the assembly hall of the Rectorate Building of the University of Málaga. 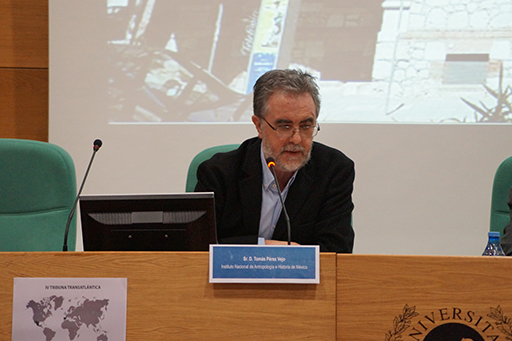 The event was presented by the professor and writer Miguel Moreta and was inaugurated by the director of the Aula María Zambrano of Transatlantic Studies, Juan Antonio García Galindo. 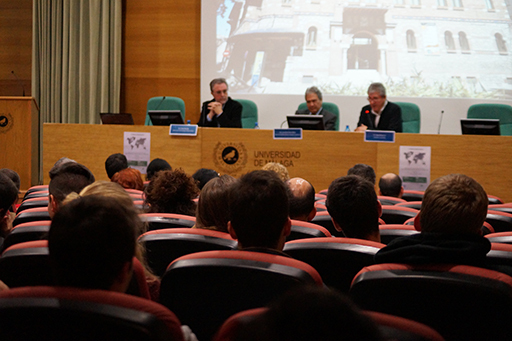 The event was attended by experts who tackled the figure of this almost unknown personality in Spain. 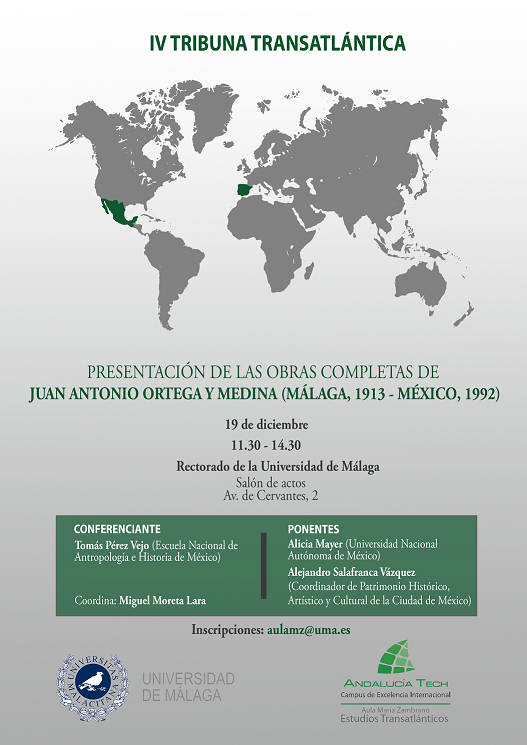 The researcher of the National Institute of Anthropology and History of Mexico Tomás Pérez Vejo offered the conference "El contexto general: El exiliado" ("The general context: The exiled”), where he spoke of Spanish and Andalusian exile in Mexico. He said: "The exiled, when they arrived in Mexico, did not land in a virgin territory, their image had already landed before them, and they had to face that conception that was not always good". 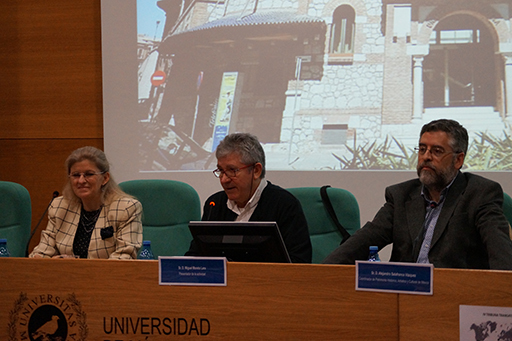 Alicia Mayer, director of the National Autonomous University of Mexico in Spain, inaugurated the second part of the function, discussing the intellectual dimension and approaches to the work of Ortega y Medina in the paper "El contexto intelectual: El historiador" ("The Intellectual Context: The Historian"), in which she emphasized the importance of the figure of his mentor in the knowledge between Mexico and Spain: "Ortega strove to make Mexicans aware of the relationship between the history of Mexico and that of Spain and the close relationship between both peoples. We can call him the great moderator of Spanish American history". Alejandro Salafranca, Coordinator of Historical, Artistic and Cultural Heritage of the Secretariat of Culture, Government of Mexico City and Juan Antonio Ortega y Medina’s nephew, presented his uncle with the paper "El contexto íntimo: El hombre" ("The Intimate Context: The Man"), where he told anecdotes, highlights of his life and moments lived with him. /cms/secciones/ajax/insertar_seccion/ /cms/secciones/ajax/borrar_seccion/ /cms/secciones/ajax/editar_seccion/ /cms/secciones/ajax/mover_seccion/ Are you sure you want to delete this section? 104177 You are about to cancel the edition. All your changes will be lost. Do you want to cancel and lost your changes?